Italy and Wales drew 3-3 in Lecce on Saturday evening in a game that was dominated by defence. Two very evenly matched teams tackled each other to a near standstill in Lecce on Saturday evening with each team going away thinking of what might have been. Wales dominated possession in the first half, and will have regretted only going into the break 3-0 ahead. However, although they had most of the ball, 80% of the first half was played in the middle third with no real Welsh chance coming other than the Robyn Wilkins penalty after 30 minutes, although Amy Evans impressed with her carrying and Lauren Smyth had a couple of nice breaks. The second half was like the first, but perhaps in reverse. Italy spent nearly 10 minutes camped on the Welsh 5m line without finding any way through, eventually having to settle for a penalty from Sillari on 60m thanks to a strong Welsh rearguard. With just 8 minutes to go Wales looked like they had won the game with Jazz Joyce seizing a gap and sprinting away for a brilliant try that was disallowed for a marginally forward pass. 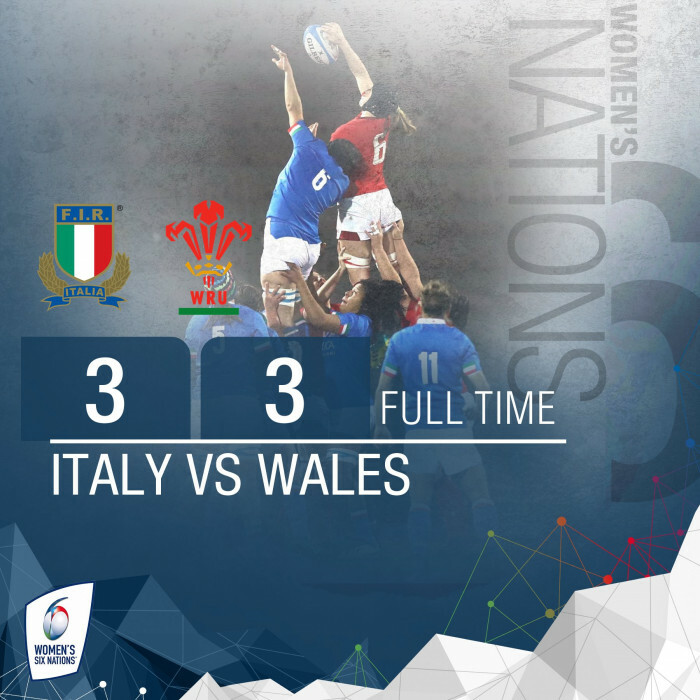 Despite the total deadlock, Italy very nearly stole the game right at the death when a Welsh attempt to clear their lines and kick to touch with the clock on 80m fell short, and from the resulting play Italy won a penalty roughly 35m out, and close to central. It was a kick that would have won the game – but it fell short and right, allowing Wales to clear and tie the game. Player of the match was Siwan Lillicrap appropriately thanks to a remarkable 23 tackles, though Giada Franco deserved recognition as well as the most threatening Italian player, coming close to scoring on several occasions.